Each week, we’ll look at another example of what I call a “moment of transcendence” – a scene from a show, a passage from a book, or anything else, that I find soul-piercingly resonant: joyful, sad, awe-inspiring, terrifying, or whatever. These moments are highly subjective, so you may not feel the same way I do, but nevertheless I’ll try to convey why I find the fragment so powerful. I hope we can enjoy it together. My favorite comic strip of all time is a Peanuts I discovered in one of my grandma’s old books. I found it years ago, and it’s stuck in my brain very distinctly ever since. But despite all my searching, I could never find it again. Recently, I became determined to track it down. 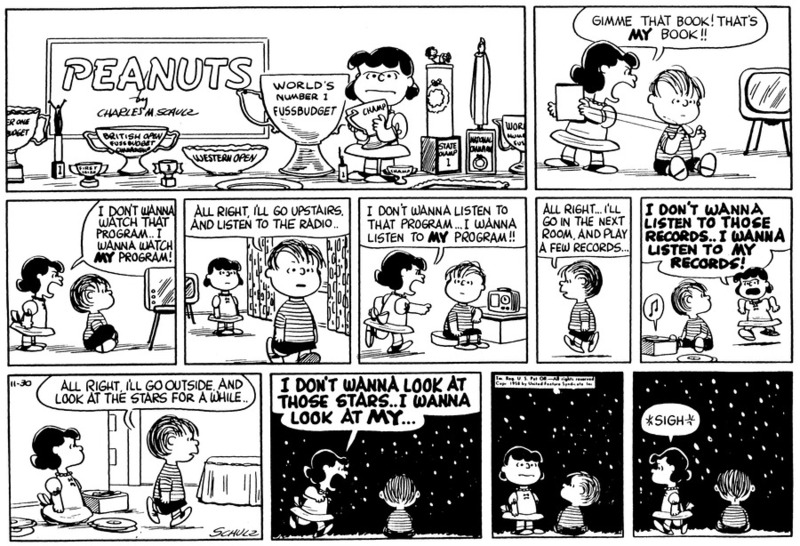 I fired up my browser, went to the Peanuts archive, and simply began clicking through the comics, in order, one at a time. The brute force method. Finally, I found it: November 30, 1958. Here it is. Click to enlarge. Peanuts created by Charles M. Schulz. Official archive at Peanuts.com. Poor Lucy. She’s so sure that life is about winning – about what she has. She can’t defeat Linus, because he’s out of the game. Linus has decided that life is about what he is. …peeping among the cloud-wrack above a dark tor high up in the mountains, Sam saw a white star twinkle for a while. The beauty of it smote his heart, as he looked up out of the forsaken land, and hope returned to him. For like a shaft, clear and cold, the thought pierced him that in the end the Shadow was only a small and passing thing: there was light and high beauty for ever beyond its reach. His song in the Tower had been defiance rather than hope; for then he was thinking of himself. Now, for a moment, his own fate, and even his master’s, ceased to trouble him. He crawled back into the brambles and laid himself by Frodo’s side, and putting away all fear he cast himself into a deep untroubled sleep. Sauron, like Lucy, is obsessed with power and possession. Not for the sake of the things themselves – he has long since lost any capacity to appreciate the beauty of what he takes – but so that no one else can have them. Only, the world is vaster than he knows. He cannot take the stars. Linus was born around 1950, so he’d be sixty-five by now. I wonder what’s on his mind these days. I did my own transcendence-inspired blog post, by the way: http://u-town.com/collins/?p=5454. Not sure yet if there will be more. Very cool. 🙂 I read your post. Thanks for telling me.